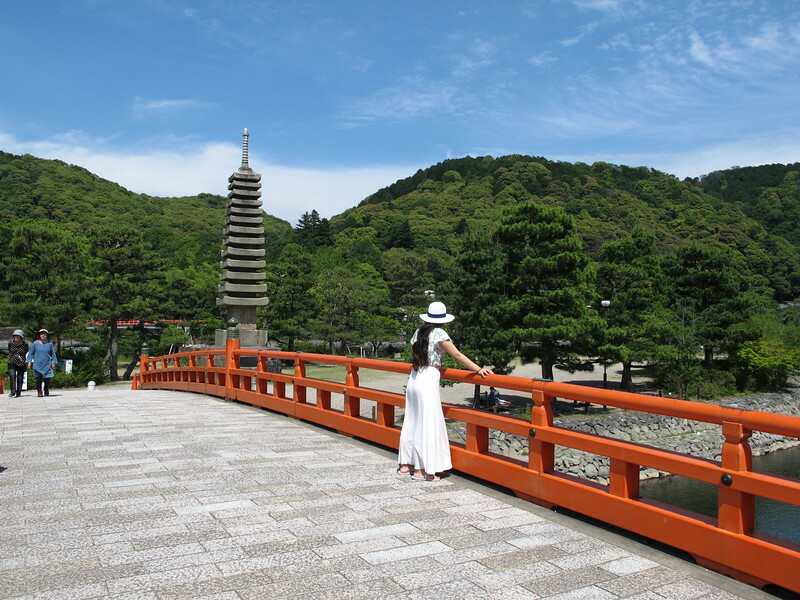 Set in a green valley to the south of Kyoto, Uji is a beautiful city with a number of fascinating historic sites clustered on the banks of the fast-flowing Uji-gawa River. Most of these locations can easily be visited in the course of a single day. 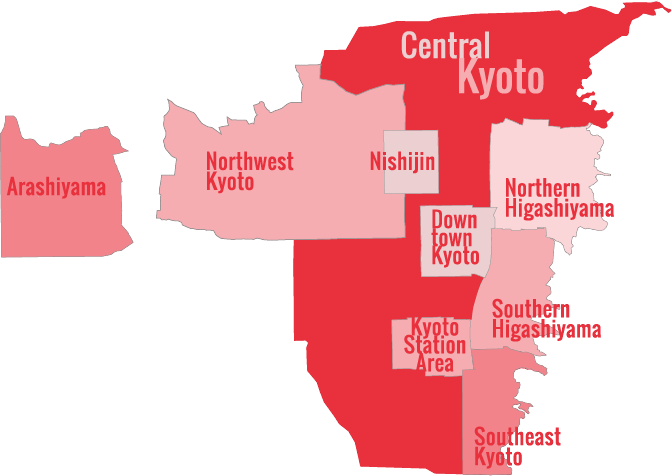 A 20-minute train trip from Kyoto, Uji has two main stations, JR Uji and Keihan Uji, but for the purposes of our walking tour, the Keihan station offers better access to the sites we wish to visit. All the major sites are well signposted so it is easy to find your way around. The first major site to greet you as you exit Keihan Uji Station is Uji-bashi Bridge. A sign by the road proudly declares it to be one of the oldest bridges in Japan, which is partially true as a wooden bridge was first built here in 646. 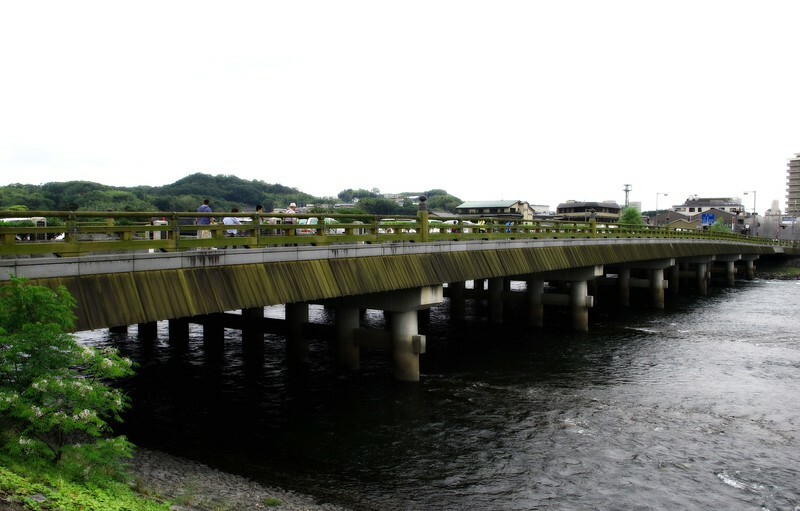 Since then, the Uji-bashi Bridge has been celebrated in art and literature, fought over in war, destroyed by fires and disasters and rebuilt numerous times. Viewing the modern incarnation of wood-trimmed concrete and steel though, one might wonder what all the fuss is about. Today, the best way to appreciate this bridge is to walk across to its mid-way point and look south down the river at the radiant landscape of green hills, and rushing waters crossed by quaint red wooden bridges. The town of Uji itself is remarkably well-preserved. 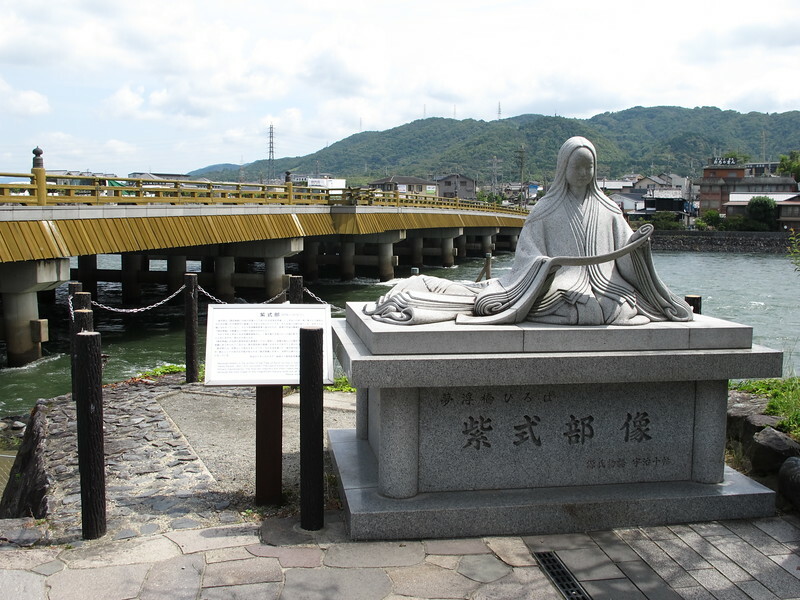 On the far side of the bridge is a statue of Murasaki Shikibu, the world’s first novelist. A poet and lady-in-waiting in the Imperial court, early in the 11th century she wrote about the romantic adventures of a “shining prince” in her Tale of Genji. 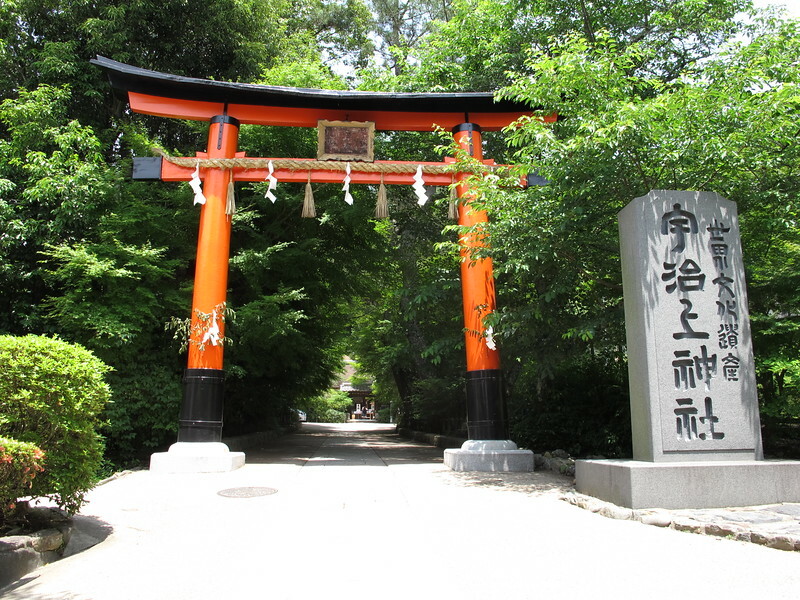 As the last ten chapters of this literary classic are set in Uji, many sites around town are associated with the story and we will learn more about her work later on the tour when we visit the Tale of Genji Museum. Bid goodbye to Murasaki Shikibu for now, and continue on to Byodo-in Omotesando Street. 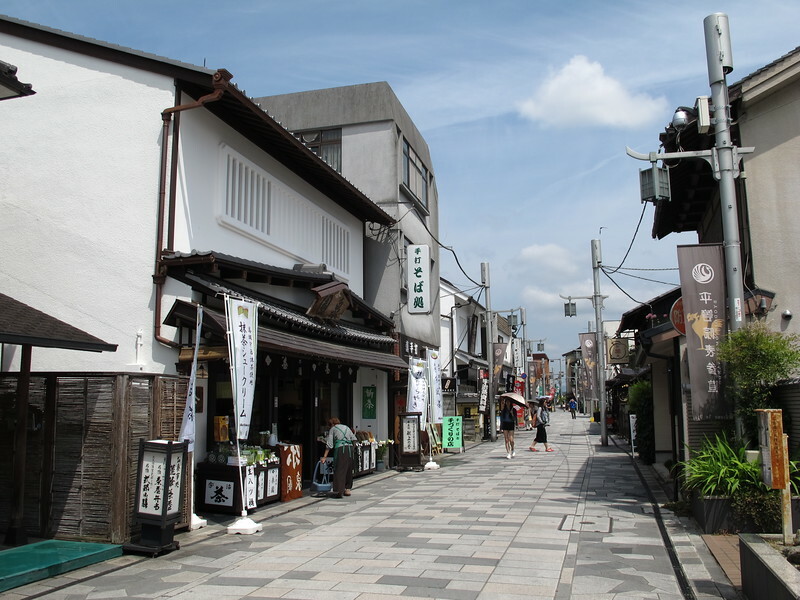 Uji is famous as a center of green tea production, and this quaint street is packed with shops selling tea and tea-related products. Here you can try tea-flavored “dango” dumplings, tea-flavored noodles, tea-flavored ice creams and tea-flavored donuts. Feel free to saunter and explore the souvenir shops and eateries before heading on to our next destination: Byodo-in Temple. 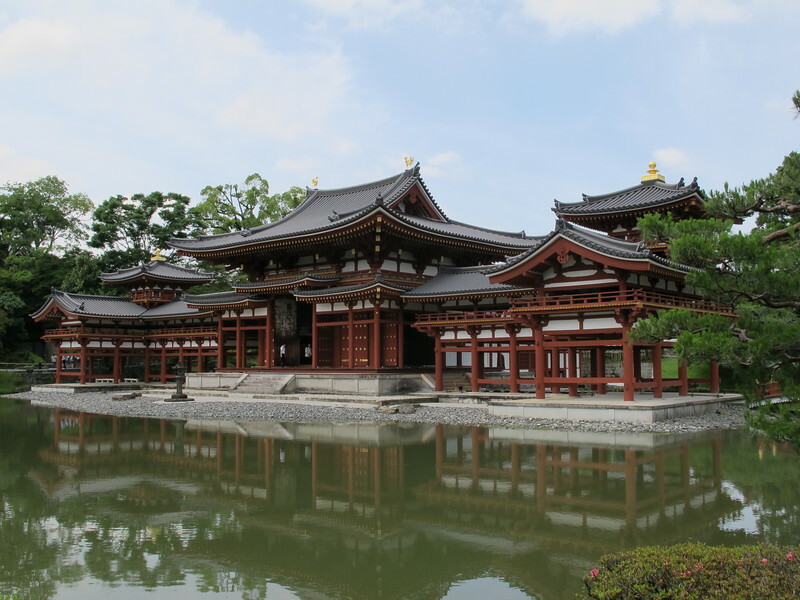 Byodo-in Temple is one of two World Heritage locations in Uji and rightly famous for its spectacular Phoenix Hall or Hoo-do. To enter the temple buy a 600 yen ticket which grants you access to the temple grounds and museum. To view inside the Phoenix Hall itself, an additional 300 yen ticket can be purchased from another ticket desk inside the grounds. First things first though, after paying your entry fee, take the left hand path around the lotus pond and admire the view. If you happen to have a 10 yen coin on you, you might want to contrast and compare at this point. That’s the Phoenix Hall depicted on the coin’s flip-side. Celebrated for its graceful symmetry, the building consists of a central hall and two long corridors which create the impression of wings. The central hall appears to be two stories high, but is actually just one story built extra tall to house the huge 3-meter-high statue of Amida Buddha which is seated within. Fujiwara-no-Yorimichi (992-1074), a Heian era noble, had inherited a villa here and in the autumn of his years he decided to build a temple on the villa’s grounds. From his residence he could view the Phoenix Hall across the lotus pond and as dusk fell the last rays of the sun would catch the face of the golden Amida Buddha within and shine out at him promising redemption. 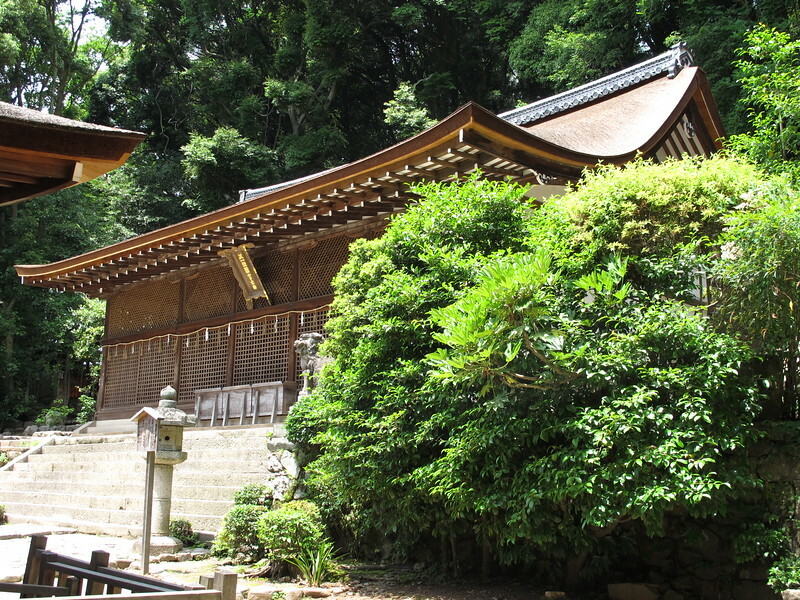 Many other temple buildings were built before Yorimichi passed away, but both they and his residence have gone. Only the Phoenix Hall (built in 1053) remains – and what a treasure it is! 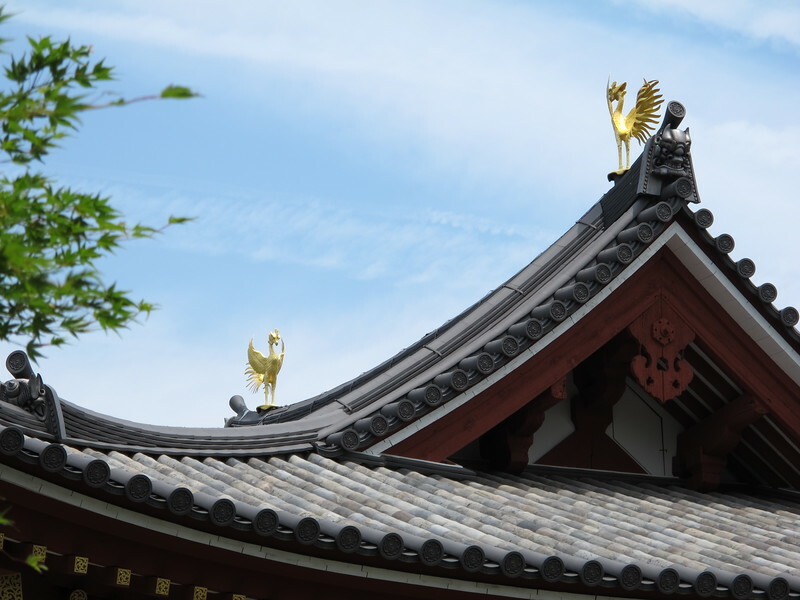 Following the path around to the rear of the Phoenix Hall brings you to the museum, which holds original artifacts from the temple and a wonderful recreation of the Phoenix’s Hall’s interior decoration as it would have appeared in Yorimichi’s day. The original is now much faded, but the recreation depicts in rich vibrant colors dancing celestial beings, child musicians, and birds bearing flowers, all in a heavenly whirl. Further along behind the museum and Phoenix Hall are some sub-temples. 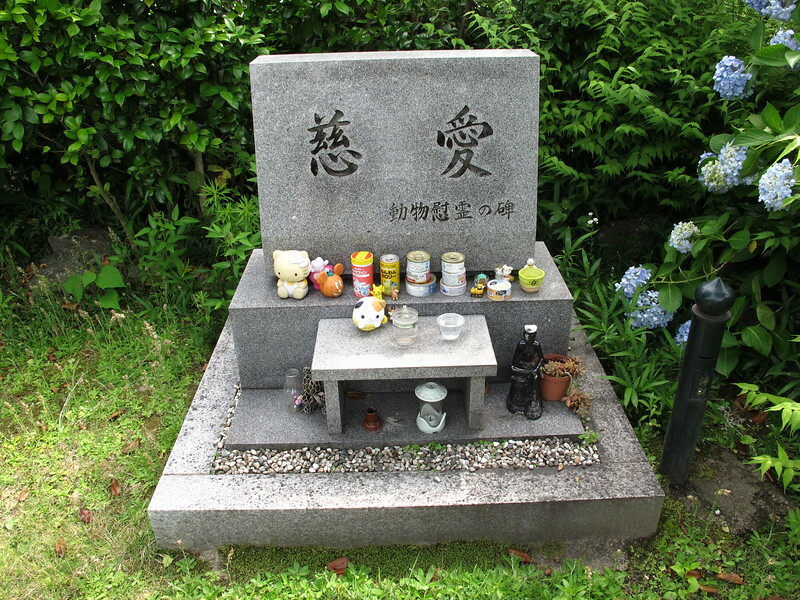 In the grounds of one, Saisho-in, you can find the grave of Minamoto-no-Yorimasa (1106–1180). A celebrated Heian era poet, Yorimasa became caught up in strife between the Minamoto and Taira clans. In the battle of Uji in 1180, Yorimasa and 300 warriors attempted to defend Byodo-in against a Taira force of 28,000. When the Minamoto defences fell, Yorimasa composed his final poem and committed ritual suicide. To enter the Phoenix Hall, you need to buy a second ticket for 300 yen from a booth on the north side of the grounds. Visits are timed every 20 minutes, so you should return to the entry point five minutes before the time printed on your ticket. A guide will then lead your group into the hall and give a talk about the building and the Amida Buddha statue. You cannot take photographs in the interior, the talk is completely in Japanese, and you may feel a little cramped standing in a narrow space with all the other tourists. For these reasons you might wonder if it is worth paying for that extra ticket. I would say it is, simply to view the statue and the interior, both of which are spectacular. The statue though covered in gold foil, is made from wood. This was carved by Jocho Busshi, a Heian era sculptor, whose special technique was to create a single figure from multiple blocks of joined wood. You cannot see the joints. The shining statue soars above you and behind it on the white plaster walls fly heavenly beings playing an array of musical instruments. Even after a thousand years it really is quite breathtaking. The grounds of Byodo-in Temple are open throughout the year between 8:30 a.m. and 17:30 p.m. For further details and to read more about the history, art and culture of this wonderful location please visit the official Byodo-in website. Aiso is an inn and restaurant not far from Byodo-in on Ajirogi-no-michi Street. 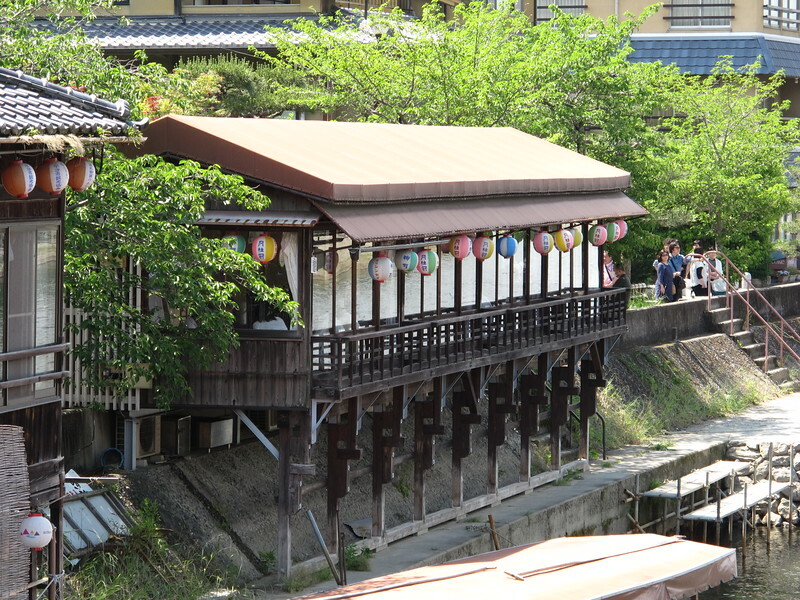 The restaurant part of the establishment is housed in what looks like a ramshackle old wooden hut on the banks of the Uji-gawa River. Once you step up into it though, it is remarkably comfortable. 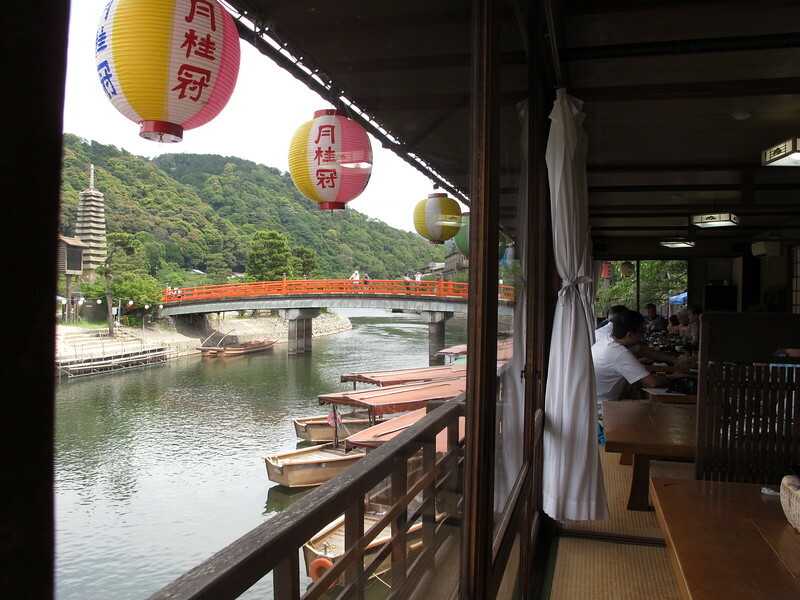 Seated at low tables on tatami matting, you can enjoy a wonderful view of boats lazily cruising the river, and beyond that the pagoda of To-no-shima Island. The staff here are super friendly and the food is really good. 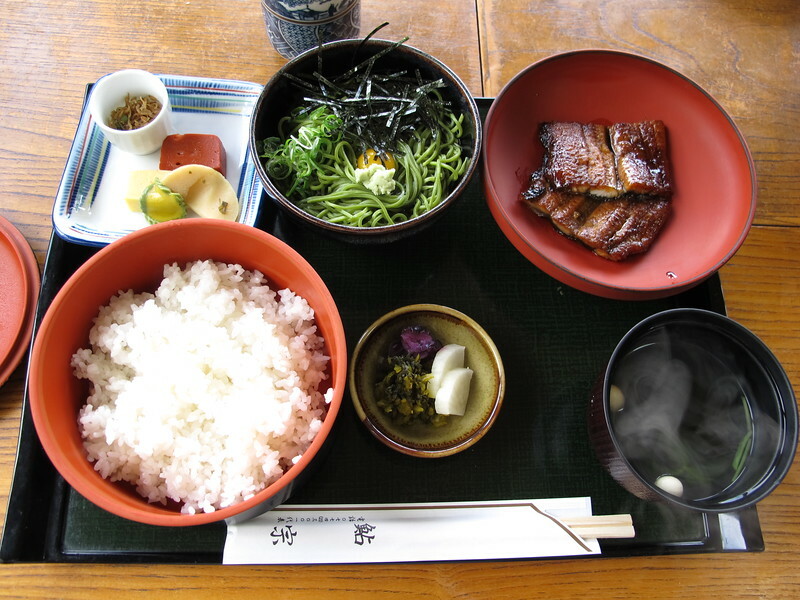 Among the many options on the menu, I particularly recommend the “unagi teishoku” or set meal with eel. Succulent eel broiled in soy sauce and sansho peppers is a specialty of the shop. 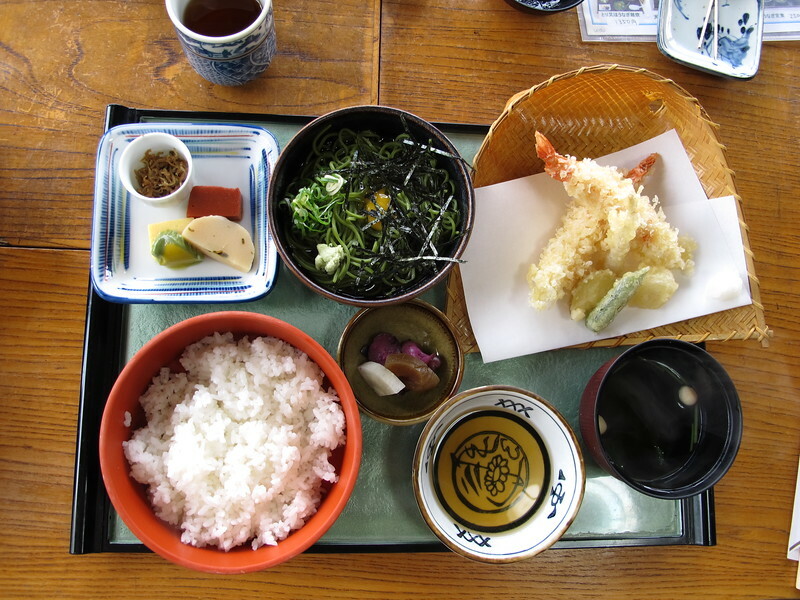 The light and crispy tempura set meal is also a good choice. Leaving the Aiso restaurant cross the Kisen-bashi Bridge to To-no-shima Island. To the east of the bridge is a 13-tiered stone pagoda, first built in 1286 as part of prayer of compassion for animals. Somewhat paradoxically to the west of the bridge and directly opposite the Aiso restaurant you will find a cage filled with cormorants. From To-no-shima cross to the far side of the river via the Asagiri-bashi Bridge. 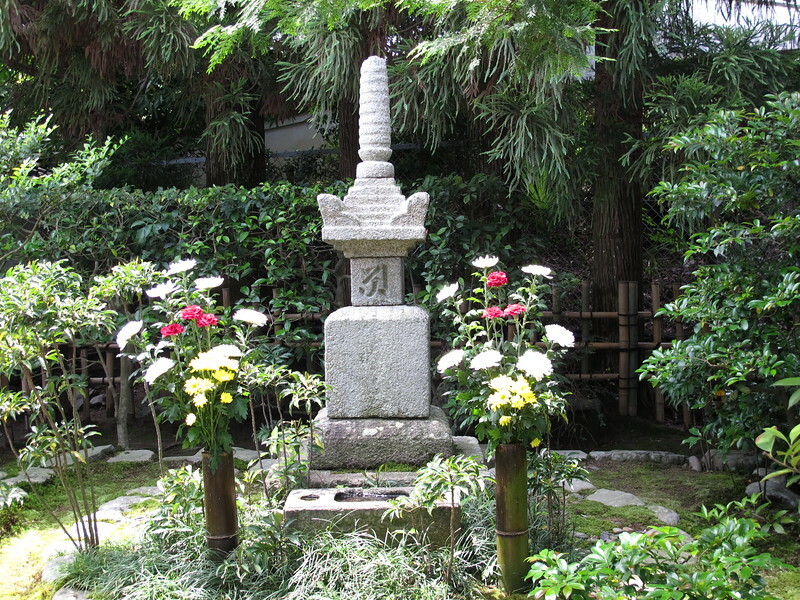 Here you will find a memorial statue to the “Uji Chapters” of The Tale of Genji. 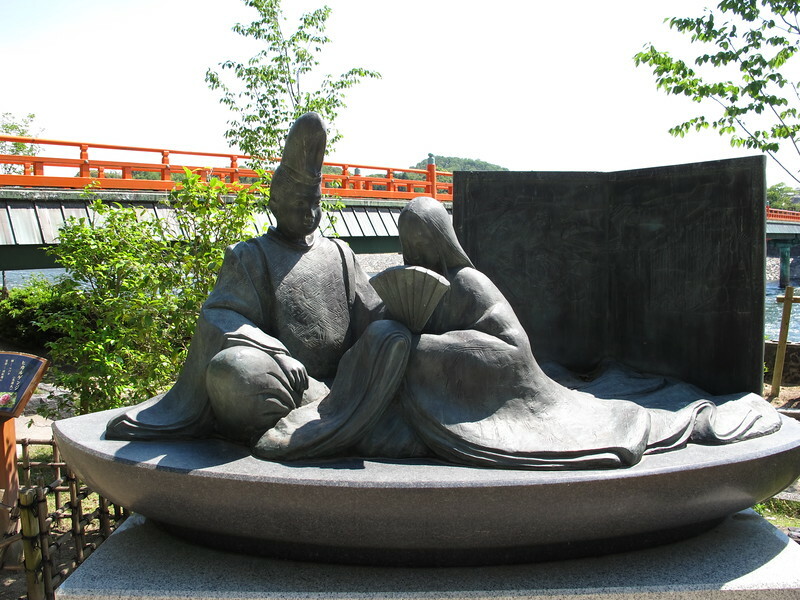 The statue depicts the lovers Ukifune and Prince Niou-no-Miya in a boat on the Uji-gawa River. The final ten chapters of The Tale of Genji take place long after Hikaru Genji himself has died, and depict the bitter love rivalries of his descendants. Many scenes take place in Uji, and the maiden Ukifune (whose name means “floating boat”) eventually throws herself into the Uji-gawa river to escape the competing attentions of Prince Niou-no-Miya and Genji’s son Kaoru. 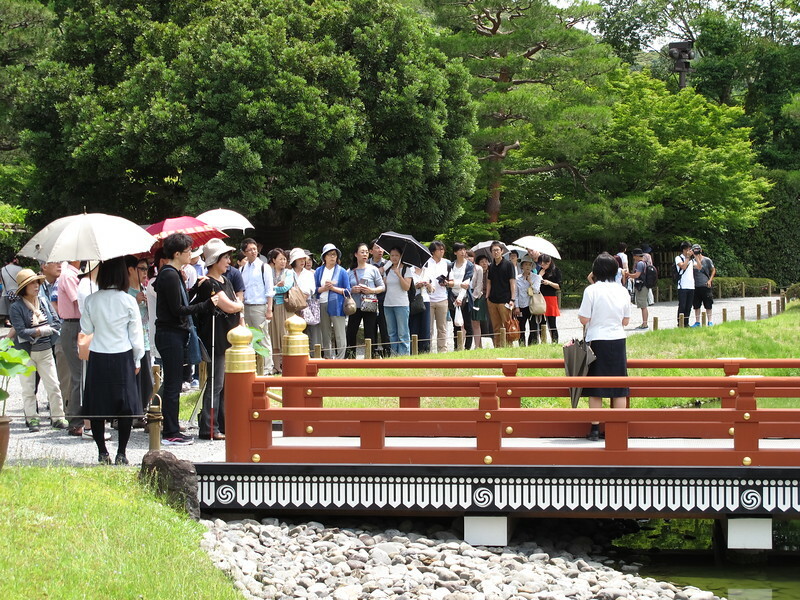 Directly across from the Uji Chapters memorial is the path that leads up to Eshin-in, named after the priest Eshin Sozu also known as Genshin, (942-1017), a great Buddhist scholar and the model for the Yokawa character in the Tale of Genji. In the book, Ukifune fails in her attempted suicide and washed up on the banks of the river she is discovered by monks. The priest Yokawa nurses her back to health and encourages her to find peace by abandoning the world and retreating to a nunnery. 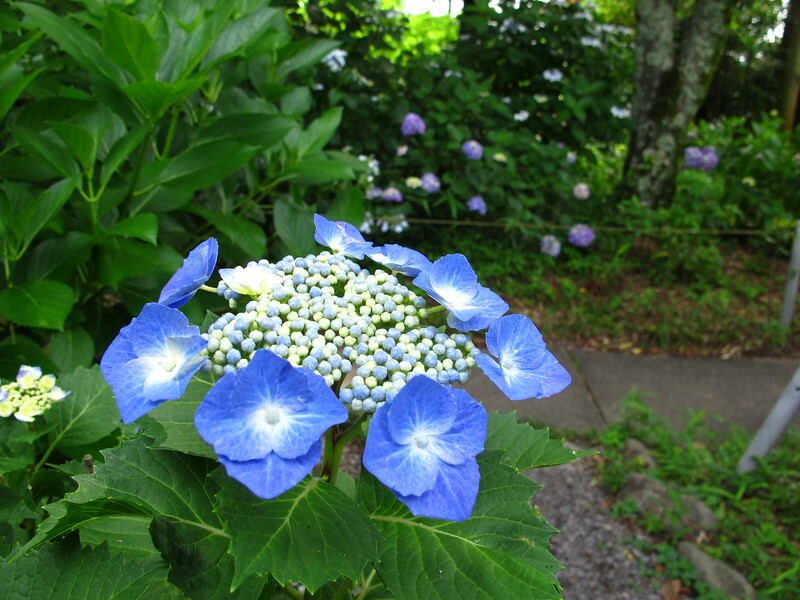 This is a small temple, and there is not so much to see here, but it does have an exuberant hydrangea garden with many varieties of the flower coming into bloom in June. Eshin-in is open from 6:00 am to 17:00 pm. From Eshin-in, follow the signs west along the river for Kosho-ji, the next stop on our tour. Leave the river path, and enter the approach to the temple. Lined with trees it is a lush green tunnel in the spring, and a riot of colorful maple leaves in the fall. At the end of the approach enter through the Chinese style gate and view the gardens. 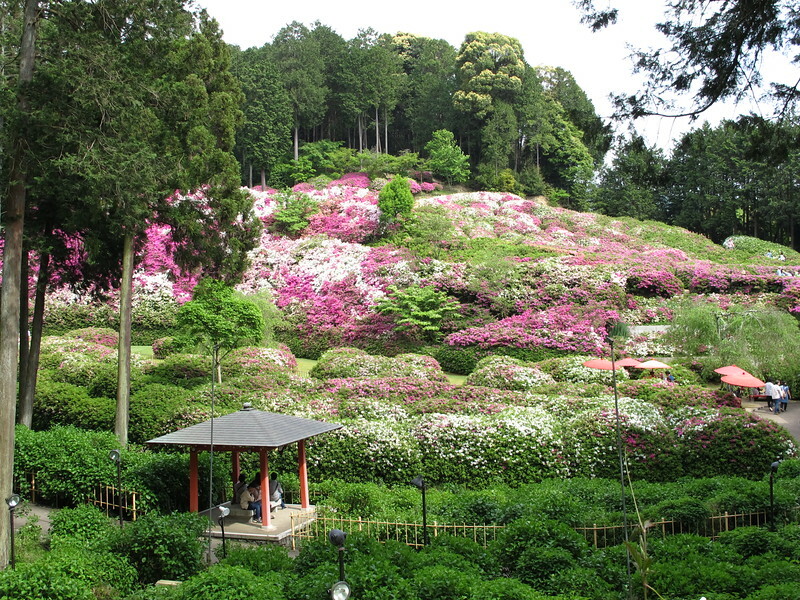 The well-pruned bushes are pink azaleas which come into bloom in May. To enter the building, go through the entrance to the left of the gateway. 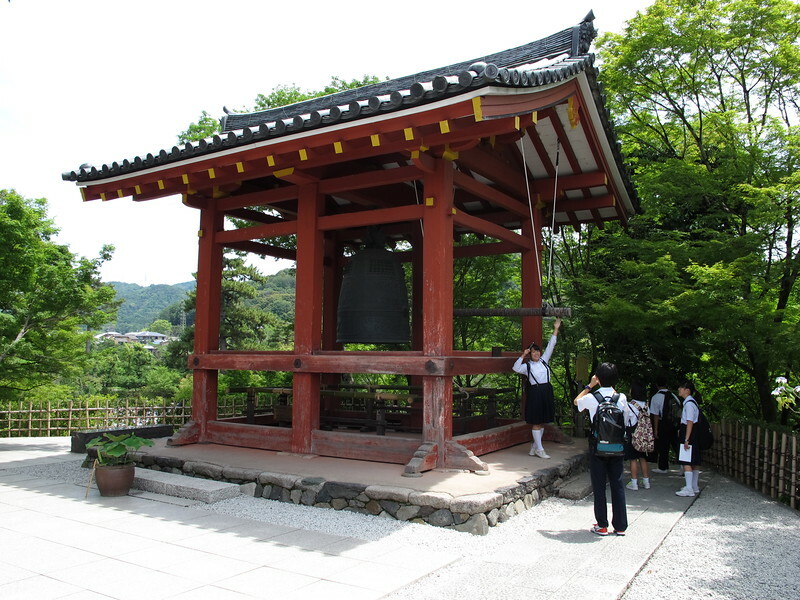 You will have to ring for a monk to pay your 300 yen entry fee. Inside you can explore a warren of wooden passageways which open up suddenly onto hidden gardens. 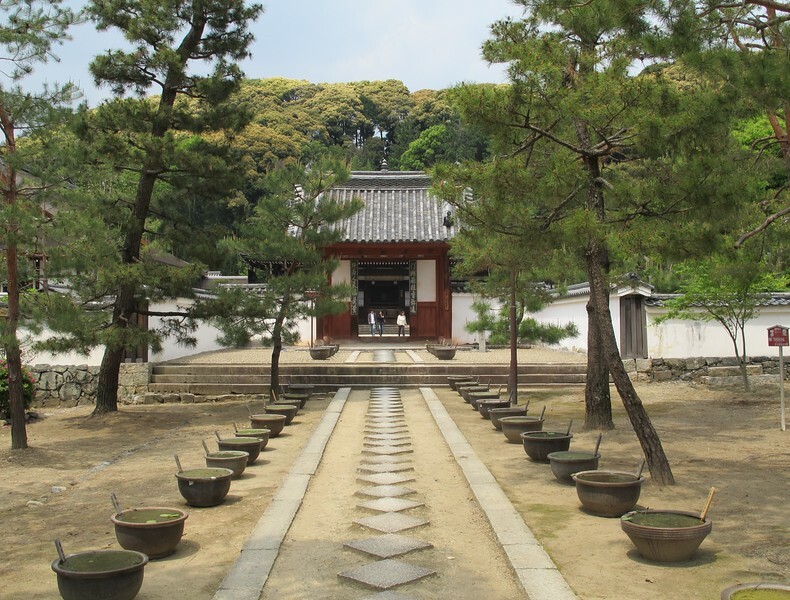 Kosho-ji is a Soto Zen temple, originally founded in Fukakusa by the priest Dogen in 1233. 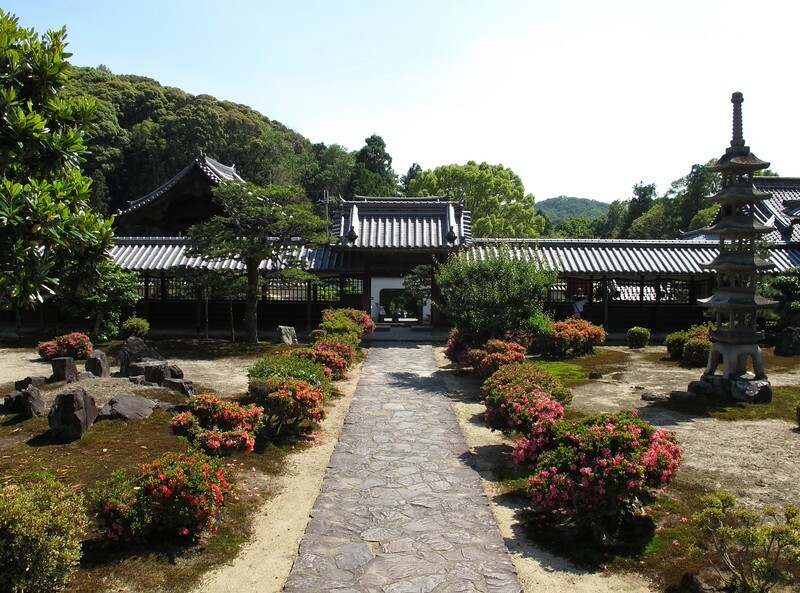 Over time the original temple fell into ruin however, and so was re-established here in Uji in the year 1649. The current buildings incorporate timber brought from the dismantled Fushimi Castle and it is said that there are blood stains on the ceiling of the main sanctuary that date from the Castle’s siege. Alas the dim sanctuary lighting makes it impossible to tell if those rumors are true. 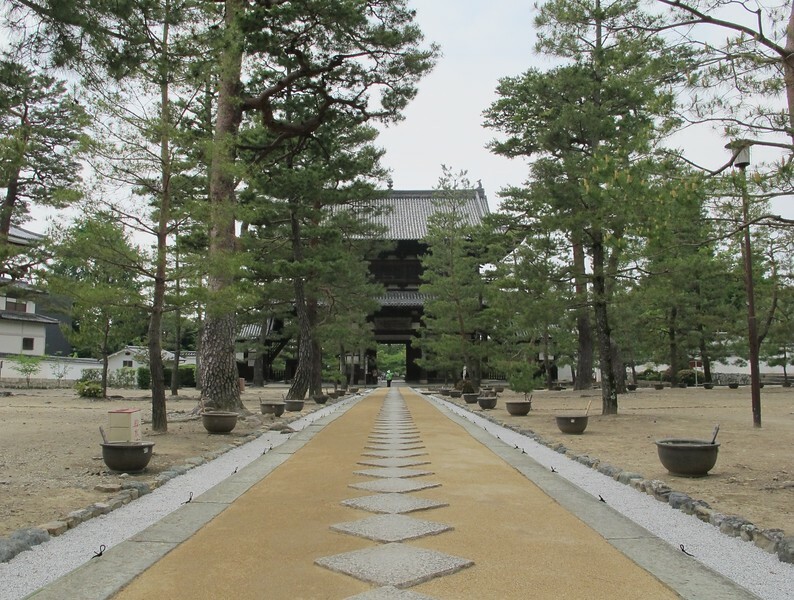 Kosho-ji is open from 9:00 am – 4:00 pm daily, but closed during the New Year holidays. 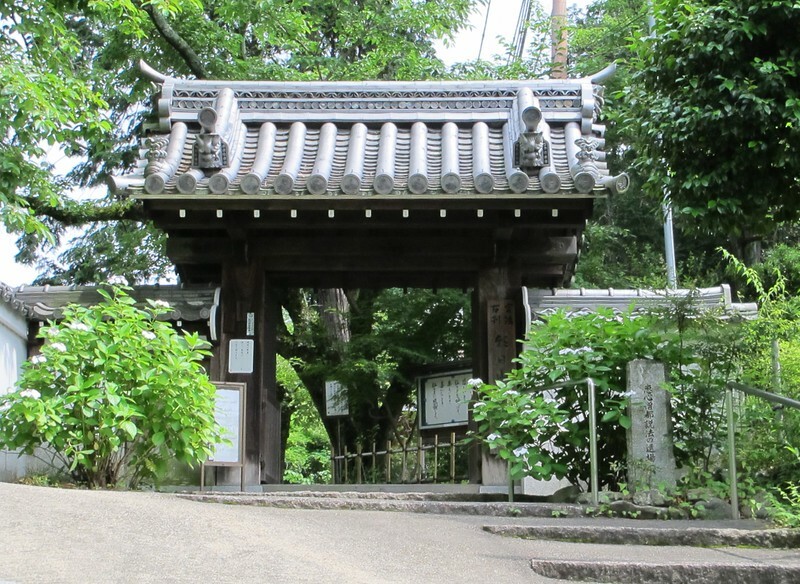 Head back towards Eshin-in and just beyond it is the entrance to Uji-jinja Shrine. Further up the hill beyond that is Ujigami-jinja Shrine, which because of its venerable age is listed as a World Heritage Site. 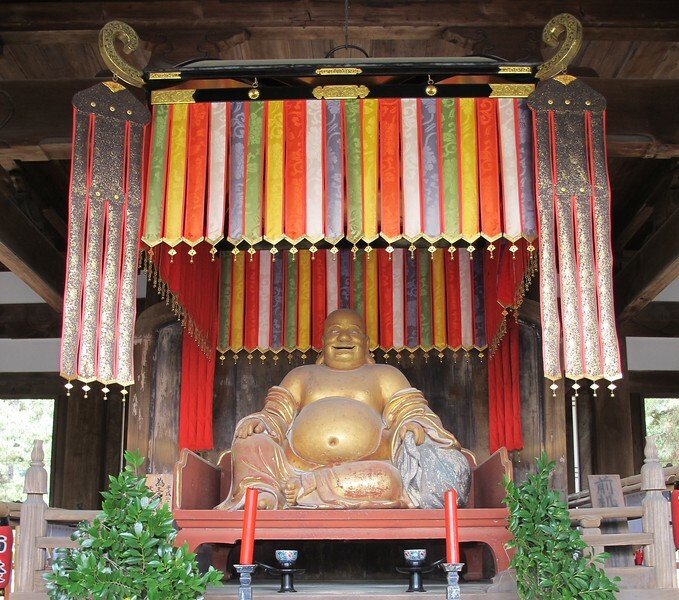 This is actually the guardian shrine for the Byodo-in, which is Uji’s other World Heritage Site. It is far less flashy than its Buddhist neighbor though, and seems to blend into the wooded hill. 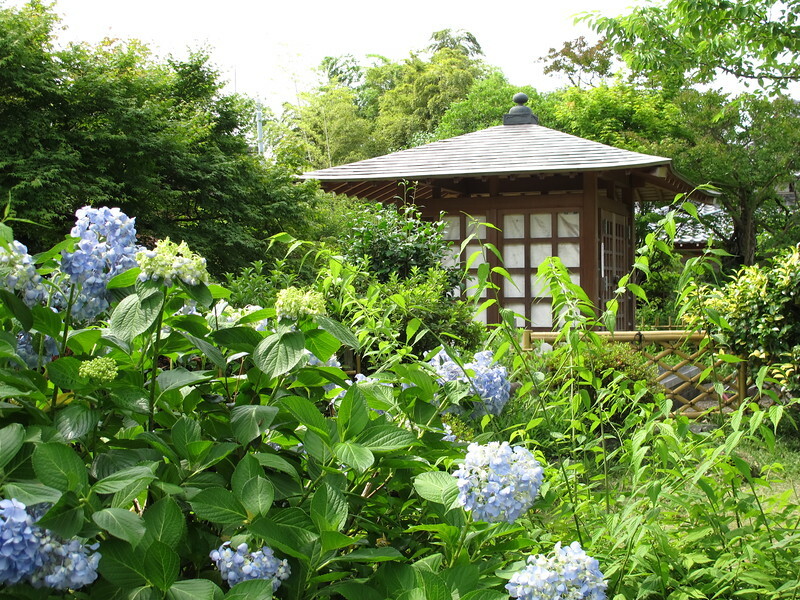 This simple Shinto architecture expresses a deep reverence for nature. Up until the latter part of the 19th century the lower and upper shrines were considered to be part of one shrine complex, but they were divided in 1868. 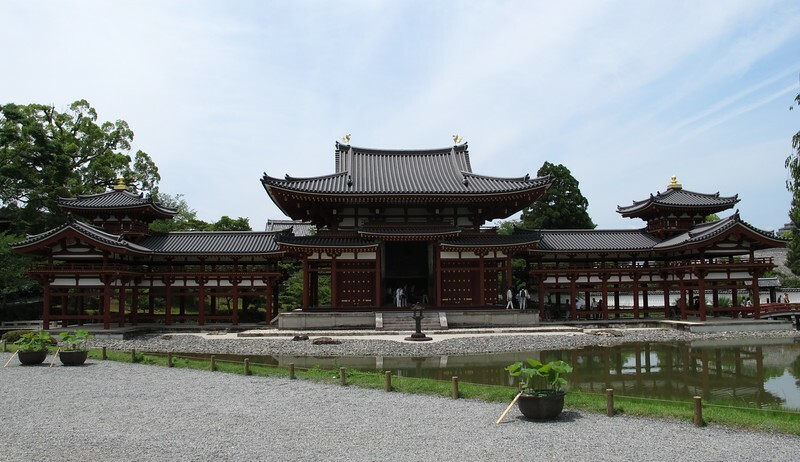 The original shrine complex was said have been built on the site of the villa of a royal prince: Uji-no-Wakairatsuko, and therein lies a tale or two. The story goes that Emperor Ojin (c. 300), chose his younger son, Uji-no-Wakairatsuko, as his successor, but when the emperor died, the young prince refused the throne. He felt he wasn’t worthy and that his elder brother was better suited to the job. However, the elder brother refused the throne too, as he did not want to go against his father’s wishes. Three years of stubborn self-effacement continued before Prince Wakairatsuko finally put an end to the dispute by throwing himself in the Uji-gawa River and his brother became Emperor Nintoku. 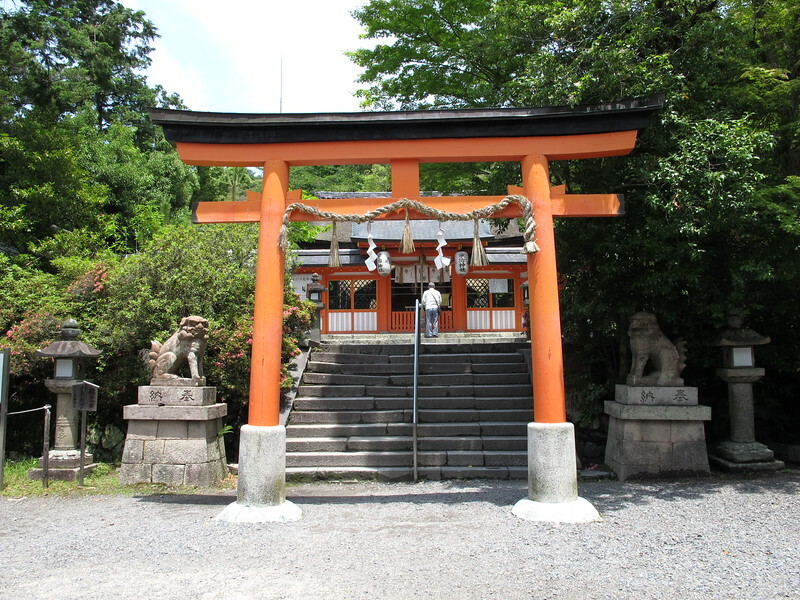 Now the two brothers and their father are all enshrined as kami, or gods, in the upper shrine of Ujigami-jinja. As you walk through the lower and upper shrines you may notice a repeated rabbit motif. 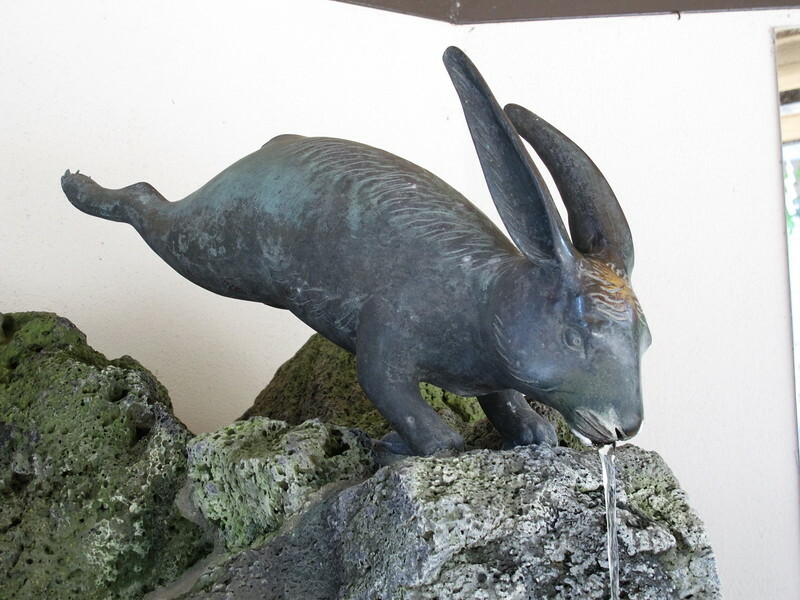 When you wash your hands in the lower shrine, the fountain is in the shape of a rabbit. In the upper shrine there are many amulets and charms decorated with rabbit designs. Naturally there is a legend behind this too. The story goes that Prince Wakairatsuko lost his way in the mountains but a rabbit showed him the way back to Uji. The rabbit would hop along a little way and then look back at the prince as if to say, “Follow me”, before hopping on a little further. This “mikaeri usagi” or “looking back rabbit” is a guardian spirit of the shrine and if we pray to it, it is said to show us the right way to live our lives. 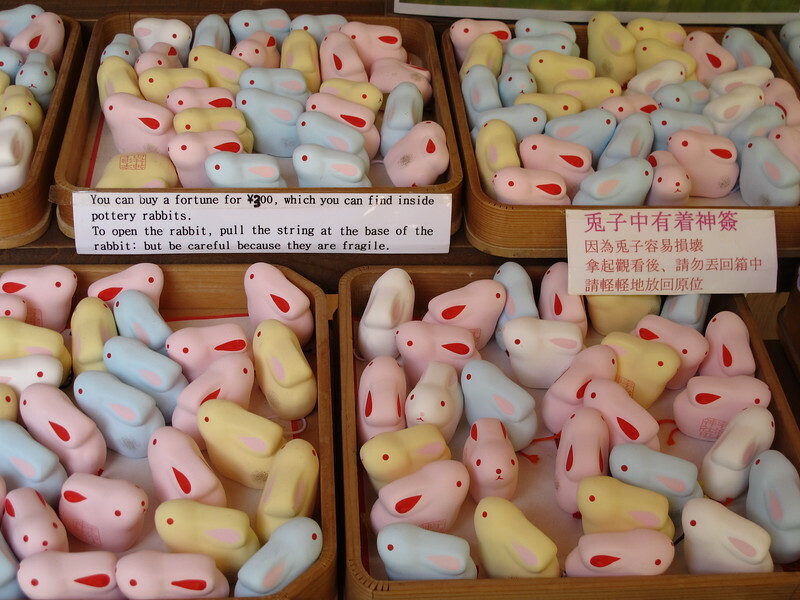 Apparently, this is why Uji was once written with the Chinese characters for “Rabbit Road”. 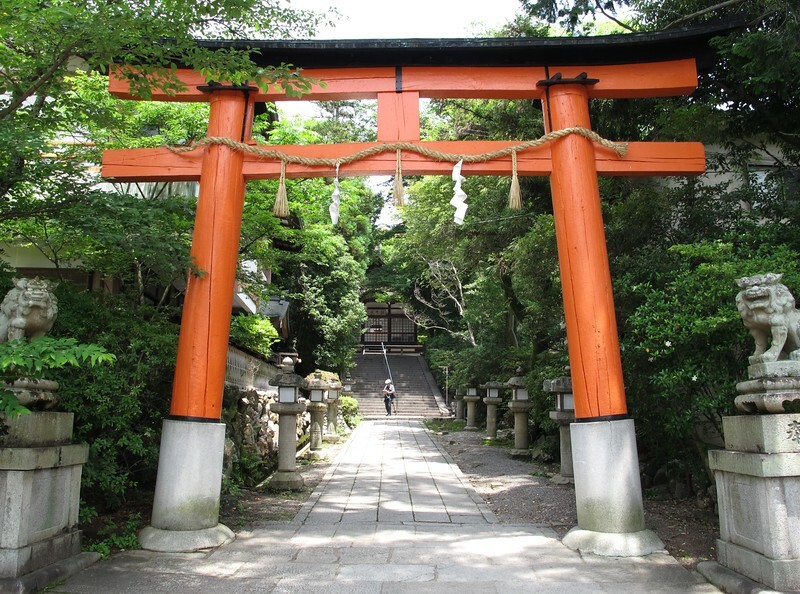 In Ujigami-jinja, the upper shrine, are some ancient buildings with World Heritage status. Usually Shinto shrine buildings are renewed and rebuilt on a regular basis, but for some reason these were not. At the rear of the shrine, the Honden, or main hall, dates back a thousand years to the Heian period and consists of three separate buildings covered by a single cypress bark roof. 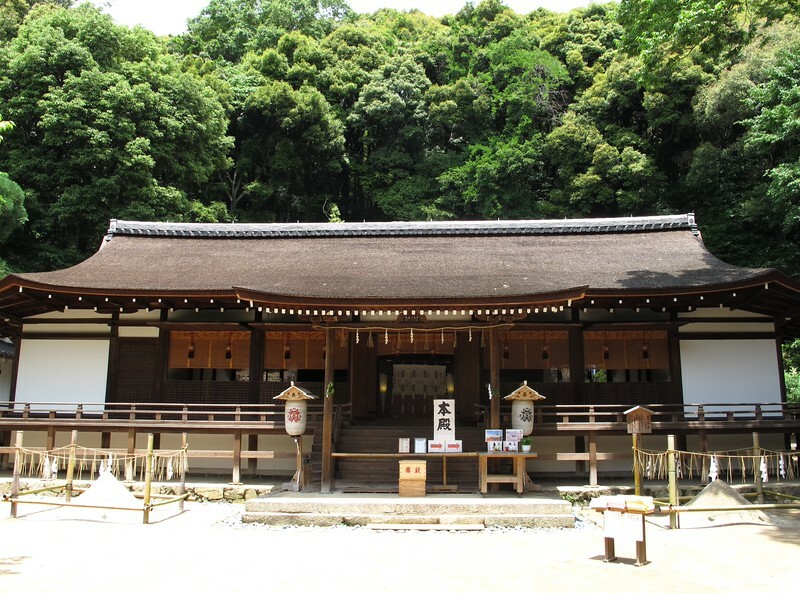 This is the oldest Shinto building of its kind in Japan. 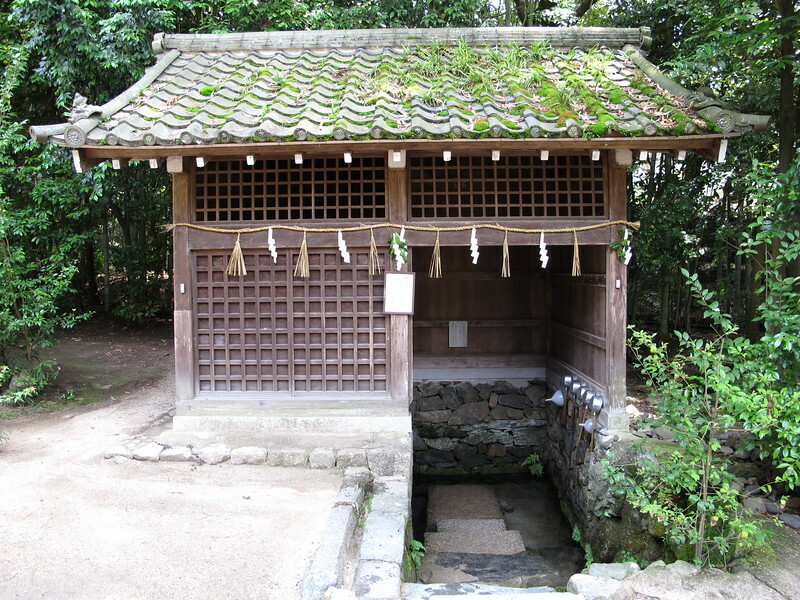 Before the Honden is the Haiden, or worship hall, which dates back to 1215. The Honden was built for the gods, but the Haiden was for human use, and so was built in a more open, airy, residential style. 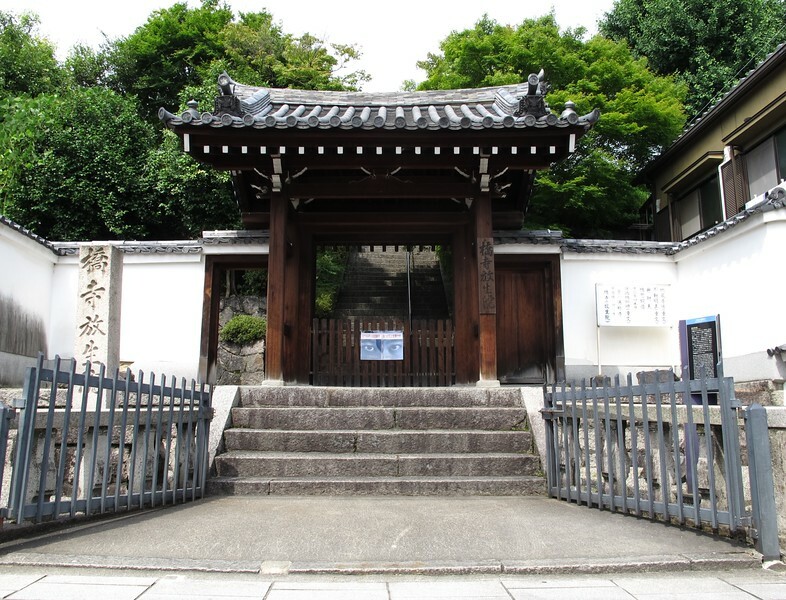 This again is the oldest Shinto worship hall in Japan. Look out also for the Kiriharasui well which has been known for the purity of its water since ancient times. 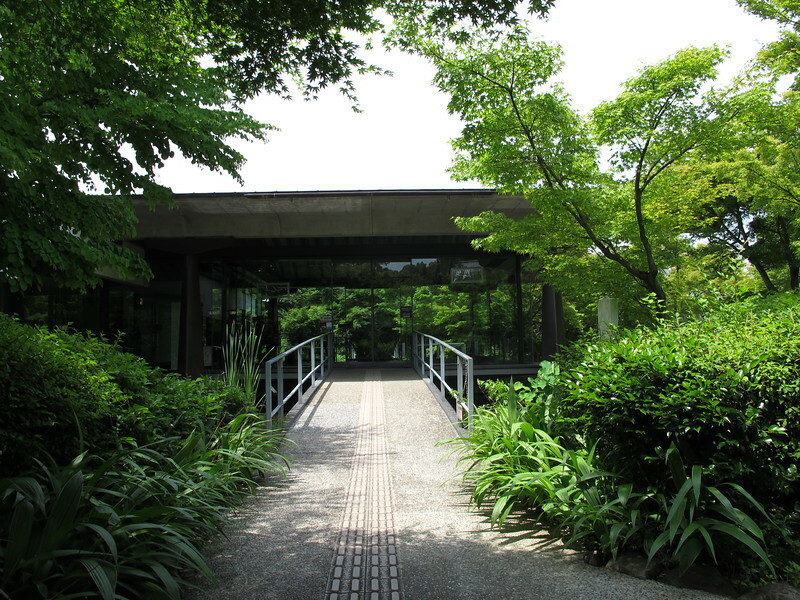 Uji-jinja and Ujigami-jinja are both open from 9:00 am – 16:30 pm. 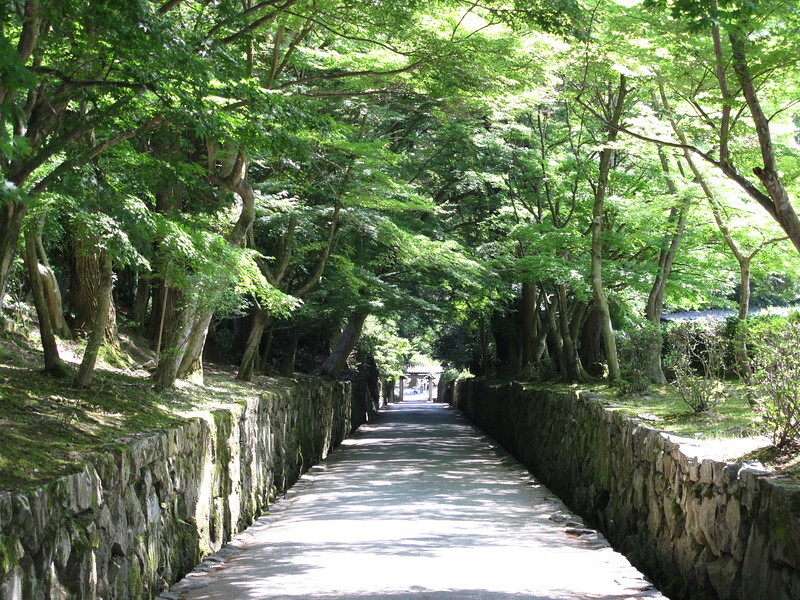 After leaving Ujigami-jinja, continue to follow the path up the slope as it curves up toward the Tale of Genji Museum. 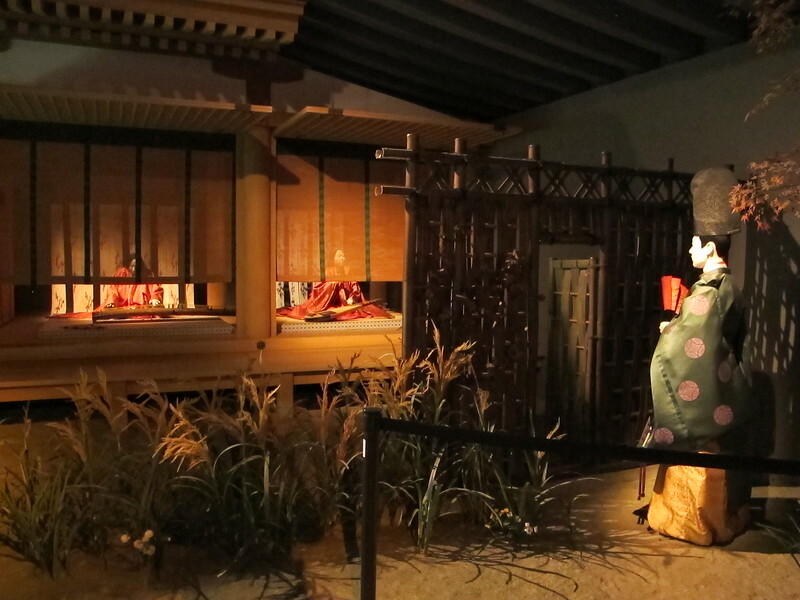 Whether or not you are familiar with Murasaki Shikibu’s classic novel, this is an excellent location in which to immerse yourself in the world of Heian court literature. Various scenes from the novel are on display, as well as historical reproductions, models and dioramas. The highlight for me was the film shown in the movie room, a highly stylized retelling of the “Uji Chapters” incorporating real scenery and traditional Japanese puppetry. An English audio device is available at reception which will prove invaluable as you find your way around and absolutely essential for the movie room. There are different audio channels for different sections of the museum. When you receive the device be sure to take a note of which channel works in which room and save yourself a lot of confusion. 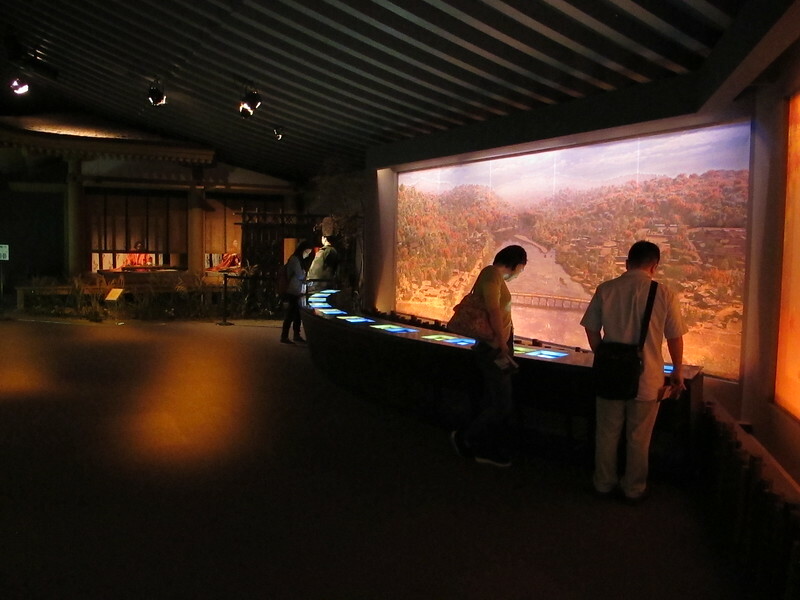 The Tale of Genji Museum is open from 9:00 am – 17:00 pm (no entry after 16:30pm). Entry costs 500 yen. If we walk back down to the river-side and then follow the course of the river west, back towards the Keihan Uji Station, we will come to Hashi-dera Temple. This is a guardian temple for Uji-bashi Bridge and so its common name, Hashi-dera, means “Bridge Temple”. 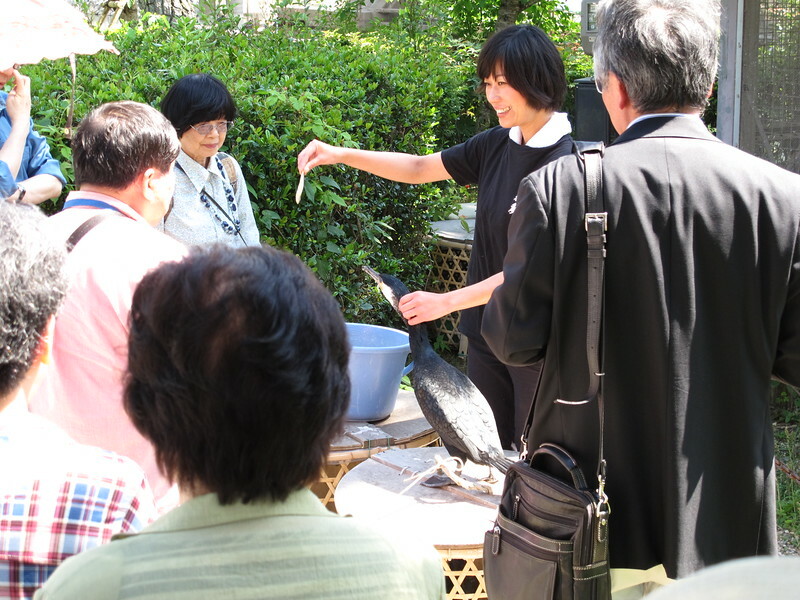 The temple’s official name though is Hojo-in, “release life” temple, which comes from a special Buddhist ceremony of compassion in 1264 when birds were freed from their cages. Even today this temple continues its tradition of compassion for animals. Amongst the Buddhist statuary in the grounds is a small memorial for departed pets on which someone has left cans of pet food and chewy toys. Also on the temple grounds is a broken stone monument, called Uji-bashi Danpi, which commemorates the building of Uji-bashi Bridge in 646. This is the oldest stone inscription in Japan and the earliest example of Japanese calligraphy. Unfortunately, this national treasure is only on view during strictly limited periods: March 1st – May 31st and September 1st – November 30th. Hashi-dera is open from 9:00 am – 16:00 pm from November through March and till 17:00 pm from April through October. 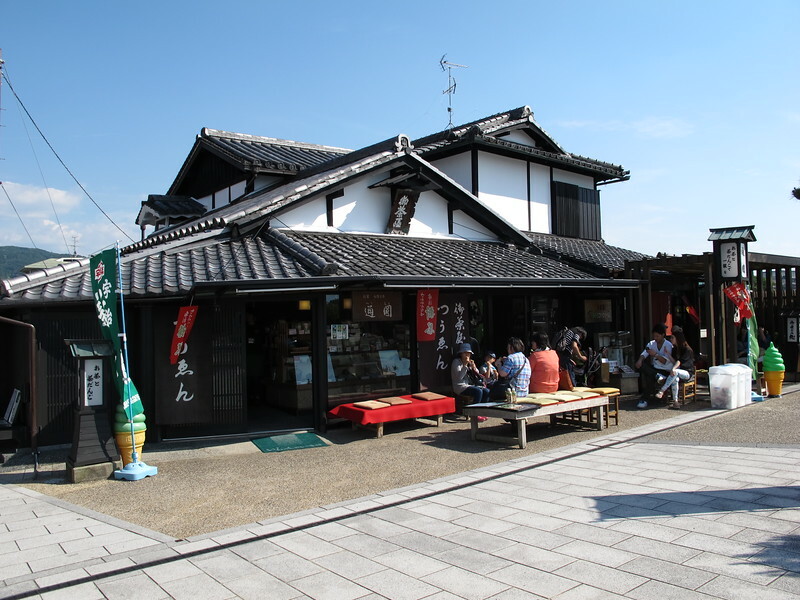 Nestled into a corner by Uji-bashi Bridge and across from Keihan Uji Station is the Tsuen-chaya tea shop, which just happens to be the oldest tea shop in Japan. It’s great spot for a break. Here you can get tea, desserts or a simple tea-flavored ice cream while you plan your next move. 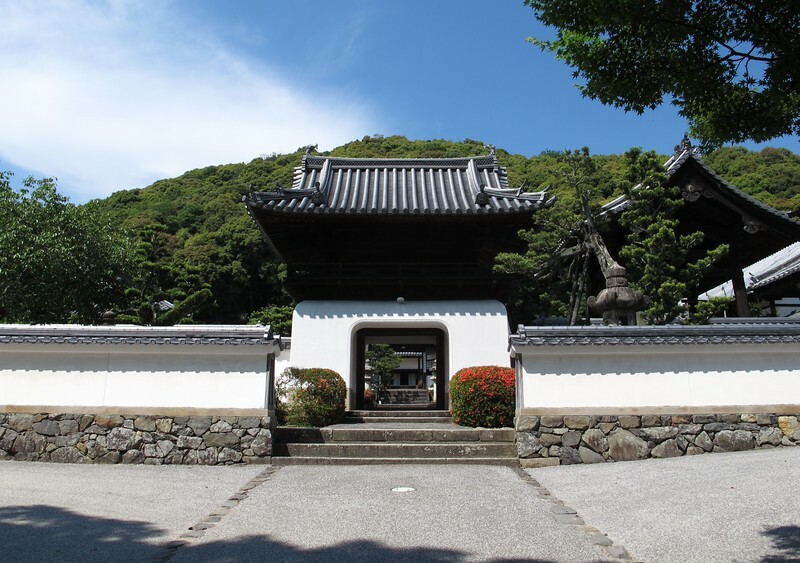 Mimuroto-ji Temple is a 15-minute walk from Mimurodo Station (one stop north of Uji on the Keihan line). You can also take the number 43 bus from the Keihan Uji station directly to the temple. If you come here at the right time of year it is absolutely worth incorporating this incredible temple into your tour. 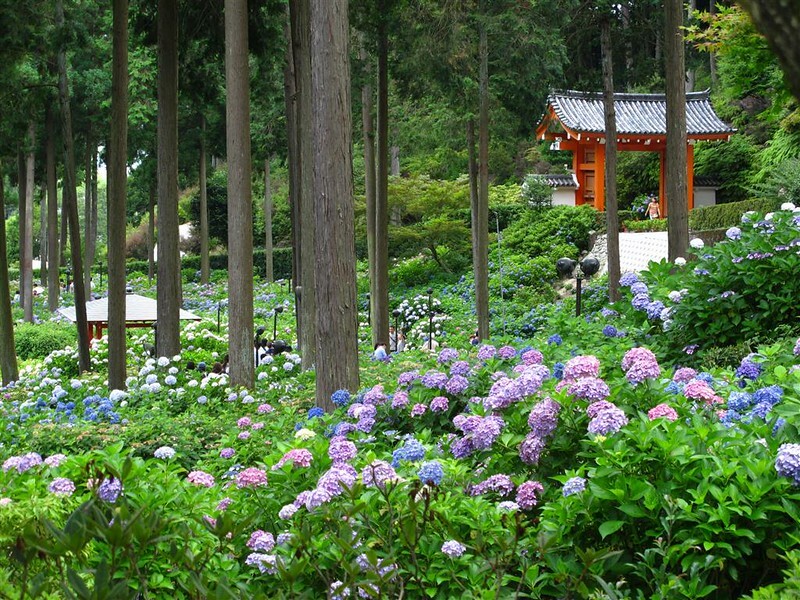 Also known as Hana-dera, or “Flower Temple”, Mimuroto-ji has thousands of azalea, rhododendron and hydrangea bushes planted throughout its grounds. 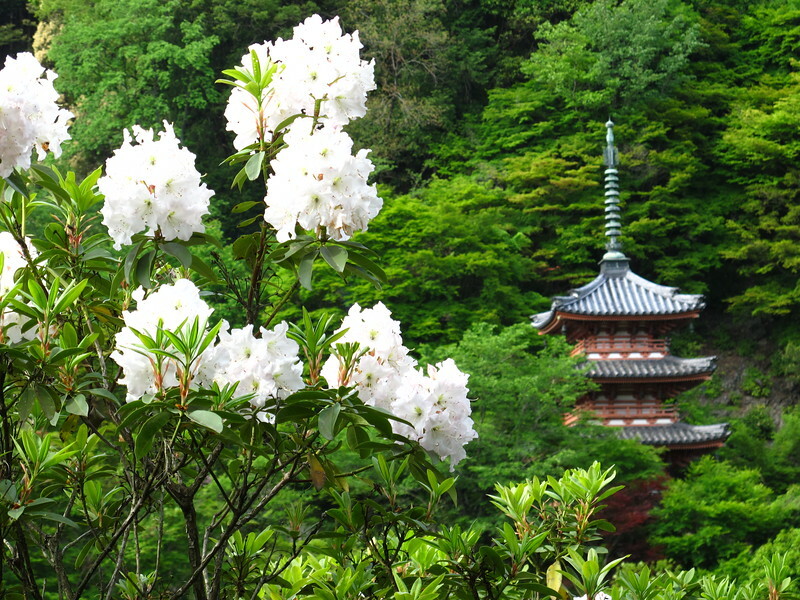 Mimuroto-ji is open from 8:30 am – 16:30 pm. Entry is 500 yen. Check the Japanese website for details. Two stops north of Keihan Uji Station is Obaku. Get off here for Mampuku-ji Temple, also known as Obaku-san. This temple was founded in 1661 by the Chinese monk Ingen, and is interesting because it represents the most recent form of Zen Buddhism to be imported from China. The temple grounds are extensive, and the architecture retains a distinctive Chinese feel. Mampuku-ji is famous for its Shojin Ryori, or Zen vegetarian cuisine, but if you want to book a meal here you will have to book it in advance. A restaurant outside the temple also serves traditional vegetarian fare. Regardless of whether or not you decide to eat here, you are sure to be satisfied by the profound sense of peace that hangs in the air. This is actually one of my favorite temples in Kyoto. Mampuku-ji is open from 9:00 am – 17:00 pm (no entry after 16:30) and the entry fee is 500 yen.